Selective Soldering is a process used in Electronics Manufacturing as an alternative or follow-up to reflow soldering where the heat of the reflow oven may be too high for particular surface mounted components on printed circuit boards. Selective Soldering may follow the reflow oven process for soldering other surface mount components able to withstand that level of heat. In these cases, great care must be taken in the selective soldering of additional components to the printed circuit board in order to avoid damaging those reflow soldered components. Nitrogen gas may be used in the process of Selective Soldering to eliminate the possibility of oxidation that would weaken the solder. The chances of oxidation increase with the added heat that is required for soldering. Nitrogen is a clean, dry, inert gas that, when applied during the soldering process, can work to displace the presence of oxygen and therefore avoid the threat of oxidation. South-Tek Systems engineers and manufactures Nitrogen Generator units that can produce high purity N2 gas from the air around us using simple PSA Generator or Membrane Generator Technology. Nitrogen Generators can supply a steady source of N2 gas - as needed on-site and on-demand without having to deal with gas companies or high pressure cylinder deliveries, storage, or handling. 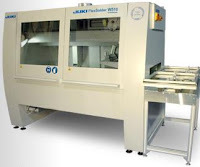 South-Tek is partnered with Juki Automation Systems to provide the Nitrogen source for their Selective Soldering machines, including the state-of-the-art FlexSolder W150. This partnership delivers great benefits for the end user in terms of controlling costs and providing high performance and quality. To learn more about the South-Tek / Juki partnership or for more information about how Nitrogen gas plays a role with the Selective Soldering process, please contact South-Tek Systems today: 888-526-6284. Nitrogen gas is used with electronics manufacturing in situations where it's critical to reduce oxygen and maintain a clean, dry atmosphere. One such example with electronics manufacturing is Reflow Soldering and Reflow Ovens. With the increased use of surface mount technology that is replacing through-hole technology, reflow soldering of surface mount components onto printed circuit boards has become more widespread. Reflow ovens provide a time and temperature controlled environment for effective soldering of surface mount components. For reflow soldering, components are placed on top of the printed circuit boards on solder pads with solder paste applied. These boards are then conveyed into the reflow oven that ultimately melts the solder particles in the solder paste, bonding the components to the pads on the circuit boards. There are different styles of reflow soldering but convection soldering generally uses Nitrogen gas applied to base metals. The N2 gas minimizes oxidation of the surfaces to be soldered. The chemical reactions necessary for soldering require high temperatures but metal oxidizes at a faster rate with heat applied and oxidation weakens the solder. Therefore, Nitrogen gas is used in order to create a clean,dry, inert atmosphere that eliminates the presence of oxygen. South-Tek Systems is an engineering and manufacturing company dedicated to Nitrogen Generator technology. Nitrogen Generators produce high purity N2 gas straight from the air we breathe using simple PSA Technology or Membrane Technology without the need for handling high pressure cylinders or relying on a gas company contract. South-Tek Systems has installed Nitrogen Generators for electronics manufacturing, specifically for Nitrogen Use with Selective Soldering, and works with a partner company, Horizon Sales, for distribution in the electronics field. Contact South-Tek Systems to learn more about using a Nitrogen Generator for Reflow Soldering: 888-526-6284.